Stephen trained at Brighton University and the Royal College of Art in fine art printmaking. He is a Fellow of the Royal Society of Painter Printmakers and a member of comittee at the Printmaker Council. Stephen has worked on printmaking in Africa, Finland, Germany and France. He has also written on printmaking education, its practice and particular printmakers. At present his main interests are in digital printmaking and three dimensional print. He is also interested in combining these with traditional methods to make unconventional prints. He has work in collections in the Americas, Africa, Asia and Europe. In recent years, Stephen has been showing in China and has won silver medals at the Master Cup and the Gold Panda contest in Beijing. Recently Stephen has expanded his interests into 3D printing and the potential for applying 3D imaging through scans to a wider potential of use across programmes, photography, fashion, applied arts, animation and other design subjects. Stephen's interest in creating prints over a three dimensional surface has led to a series of works produced using a 3D printer, sourced from earlier bronze cast sculptures involved with primitive and ritual imagery, plus an interest in informal/ architectural structures. These have further developed into works produced through a colour 3D printer and constructing works drawn up through CAD software, combined with 3D scans in the near future. This continues Stephen's interest in combining digital means with conventional printmaking into an extended practice. 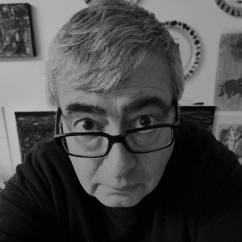 Stephen has a special interest in etching, relief and engraving plus experience with printing on difficult and unconventional surfaces. Illustration/ Cartoon/ Printmaking, traditional and digital / Fine Art/ 3D Print/ Metal casting. Stephen has a particular interest in using 3D scans in a cross-disciplinary way and in combination with the virtual drawn images in CAD software to produce a hybrid form through the 3D printer. These extend the ritual/African/Northern European primitive forms produced through casting and also offer the opportunity to explore the printing of imagery over the surface of a 3D print. He hopes to extend the possibilities of creating a combination of 2D digital images integrated over virtual conceded 3D forms, marrying the possibilities of both forms of printmaking. Invited artist/cartoonist in Donnguan City, China.